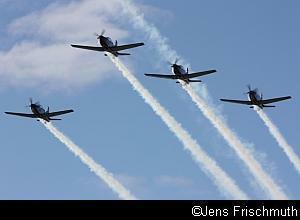 The 2009 Overberg Airshow took place at Air Force Base (AFB) Overberg in the Western Cape on the 14th of November. AFB Overberg is the home of the once top-secret Test Flight Development Centre (TFDC) and has been part of some of the biggest aviation projects ever undertaken in South Africa since it opened in 1987. The TFDC played a major role in the evaluation and development of the Cheetah, Oryx, Rooivalk, Pilatus PC-7 Astra, BAE Hawk, Agusta 109 and the SAAB Gripen. Besides testing and developing aircraft, it is also very involved in missile and armourment evaluation tests. 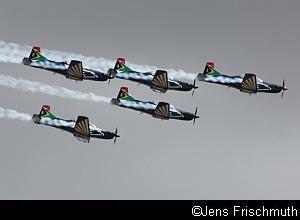 The biennial TFDC Airshow is always a highlight on South Africa's aviation calendar. At this isolated site, the South African Air Force (SAAF) can show its full might and stage air capability demonstrations that include live weapons firings on the adjacent Overberg Test Range. Unfortunately, this year's event was overshadowed by the crash of one of Thunder City's English Electric Lightnings, in which the pilot Dave Stock sadly lost his life. Proceedings started off under a mainly cloudy sky with a parachute display by the SAAF Golden Eagles Parachute Display Team. Lt. Col. Jannie Scott displayed the BAE Hawk Mk 120 Lead-in Flight Trainer and then the Silver Falcons, the official display team of the South African Air Force, flew their morning display in their Pilatus PC-7 Astras. All the members of the Silver Falcons are instructor pilots at the Central Flying School at Air Force Base Langebaanweg and the team is expertly led by Maj. Scott Ternent. 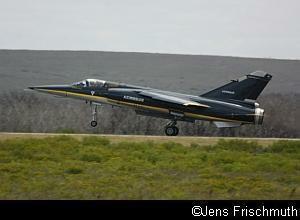 The spectacular SAAB JAS-39 Gripen display was flown by Lt. Col. Charl Coetzee. The organizers had provided a mobile viewing platform for members of the media, which was towed by tractor to within 40 metres of the runway for the first few displays of the day. Watching the Gripen take off at such close distance was a truly amazing experience. The plane accelerated in full afterburner and only needed 400 metres of runway to get airbourne in about 10 seconds. It had enough surplus energy to allow it to perform an immediate tight right hand turn and still climb to altitude. The display highlighted the impressive agility and responsiveness of this fourth generation fighter. The Gripen's equally impressive short landing performance was demonstrated at the end of the display. The huge smile on Charl's face as he taxied the Gripen back bore testimony to the fact that he enjoyed giving the performance as well. Other morning displays were flown by a Robinson R-44 helicopter, the MX-2 aerobatic plane, two North American AT-6 Harvards and a solo display of the Pilatus PC-7 Astra was flown by Lt. Col. George Muller. 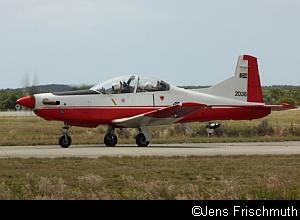 This Astra was painted in the standard white and red trainer colours as used by the Central Flying School at AFB Langebaanweg (as opposed to the Silver Falcons, whose display aircraft feature their own distinctive colour scheme). An Aero L-29 jet was displayed by Lt. Col. Koos Kieck. 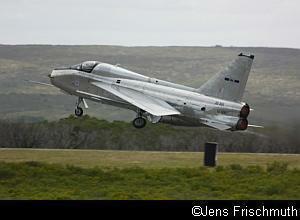 This plane made its airshow debut in South Africa at the Overberg Airshow. It belongs to Austrian businessman Michael Honsa, who is now based in Cape Town. 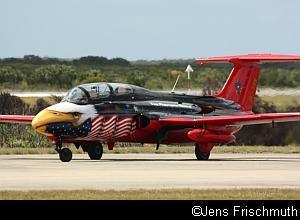 The L-29 features the striking "Austrian Eagle" paint scheme, which was designed and painted by the airbrush artist Jeremy Nolan. The morning display of the Mirage F1AZ was flown by Lt. Col. Johannes "Blokkies" Joubert, who is a test pilot and has been involved in the flight test activities at the Gripen Flight Test Centre based at AFB Overberg. The Mirage F1AZ's maneuverability was praised by the pilots who flew the plane when it was in service and Blokkies did justice to the plane's capabilities by flying an impressive display. 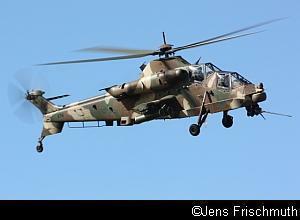 Helicopter action started off with a display by the highly capable and maneuverable Denel Rooivalk attack helicopter. 16 Squadron at AFB Bloemspruit became the first SAAF squadron ever to be equipped with a true battlefield support helicopter when it started to receive the first of 12 Rooivalks in May 1999. The squadron has recently received full operational status after serving as a test and evaluation unit for many years. This demonstration was followed by John Caudwell's display of Thunder City's upgraded Puma which features a state-of-the-art Chelton glass cockpit suite. 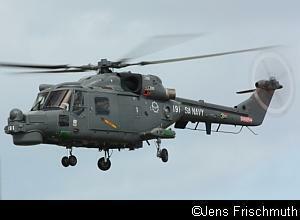 The third helicopter to fly was the Atlas Oryx, a South African development that is similar to the AS332 Super Puma. The fateful display of Thunder City's English Electric Lightning T Mk5 ZU-BEX took place just after midday. Dave Stock took off in full afterburner and started his display routine as normal. After a few passes, he broke off the display after reporting hydraulic problems with the aircraft. Whilst he climbed to altitude towards the east to sort out the problems, the emergency vehicles stationed themselves at various points along the runway as a precaution and the safety barrier was raised at the end of the runway. Sadly, the plane never made it back to the airfield. Instead, a few minutes later the horrible sight of a black plume of smoke some kilometers away from the airport bore witness to the fact that the plane had impacted the ground. Although there was some initial hope that the pilot had ejected safely, it soon became evident that the pilot had reported that his attempts to eject had failed and he thus went down with plane. 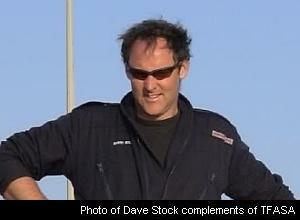 Dave Stock had accumulated 15900 flying hours and was an accomplished senior test pilot in the South African Air Force, where he flew Impalas, Mirage F1s and Cheetahs. After a stint as a commercial pilot with South African Airways, Dave returned to test flying and, among other things, worked with BAE Systems on the Hawk project. He had been associated with Thunder City for 10 years and flew their English Electric Lightnings, Hawker Hunters and BAE Strikemasters. Over the years, he had delighted spectators with his displays at over a hundred airshows. Our condolences go to his family and close friends. Following the accident, proceedings were put on hold as the emergency vehicles made their way to the crash site. First to respond was an Augusta 109 helicopter and the two Oryx helicopters and then the fire trucks made their way through the shrubs to the site. After a meeting with all the display pilots and the safety director, the decision was made to continue with the airshow. Proceedings resumed after a break of almost 2 1/2 hours with the South African Air Force's Air Power Demonstration. 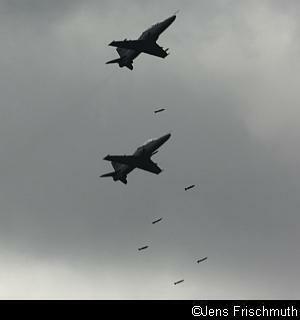 Two BAE Hawks performed a live bombing run. Both planes approached the airfield in formation at low altitude from the west and then pulled into a 45 degree climb and released a total of seven 250lb bombs simultaneously. The bombing run was aligned so that the bombs would impact on the Overberg Test Range, which is situated on the east side of the runways. The Rooivalk attack helicopter demonstrated its capabilities with simulated rocket attacks and the provision of battlefield support. 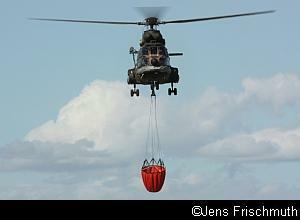 An Oryx also demonstrated its troop support role and an Agusta 109 showed its rescue and extraction capabilities. Understandably, Thunder City did not participate further in the airshow. The afternoon displays of the L-29, Pilatus PC-7 Astra Solo display, Robinson R-44, Rooivalk and BAE Hawk were repeats of the morning program. The Hawk did, however, dispense flares in the afternoon. The Oryx's display included the demonstration of the Bambi bucket, which is used to carry and drop large amounts of water and is used for fire fighting purposes. An Aero L-39 jet, owned and flown by Dave Mandell, flew for the first time in the afternoon, as did the Agusta Westland Super Lynx 300 helicopter. Since February 2009, four Super Lynx helicopters have been in service with 22 Squadron based at AFB Ysterplaat in Cape Town. Although flown by SAAF pilots, their role is to extend the SA Navy's maritime defence capability and their use is fully integrated with the Navy's operations. 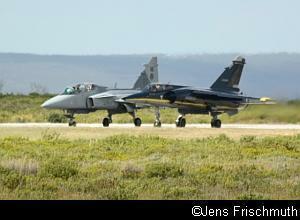 A highlight of the airshow was the fly-off between the Mirage F1AZ and the SAAB Gripen. The two jets lined up on the runway together and the Mirage F1AZ, flown by Col. Leon Bath this time, started its take-off run first. 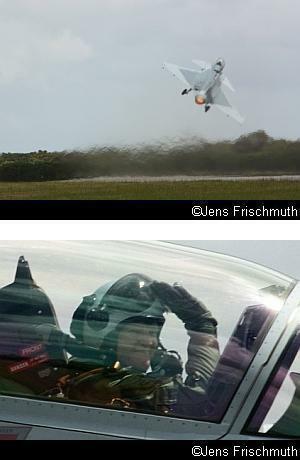 Lt. Col. Charl Coetzee then showed that the Gripen could get airbourne much quicker. The two planes flew various circuits together, the Mirage always trailing behind. At the end of the display, the two planes performed a joint fly-by, after which the Mirage landed first. Despite deploying a drag parachute to slow it down, it used much more of the runway than did the Gripen. 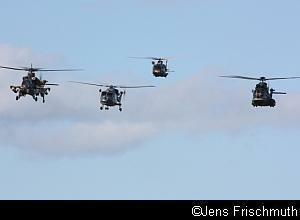 Another highlight was the helicopter formation that consisted of a Rooivalk, Lynx, Oryx and Agusta 109 helicopter. The four different types of helicopters performed a joint fly-past from right to left and then lined up in a row and hovered over the runway. The final display of the day was flown by the Silver Falcons. Towards the end of their routine, the official public announcement was made that Dave Stock had indeed lost his life in the Lightning accident and the Silver Falcons flew the missing man formation in Dave's honour to the music of the song "The Wind beneath My Wings".